The Prosthodontics Department is responsible for teaching undergraduate students and postgraduate students in several areas: Fixed Prosthodontics, Removable Prosthodontics, Dental Laboratory Technology, Occlusion and TMJ Dysfunction, Dental Implants, Dental Ceramics, Maxillofacial Prosthodontics. Our students understand value and apply evidence-based dentistry to the solution of patient’s clinical problems. The field of Prosthodontics involves the restoration of morphology, function and esthetics. They are taught the value of life-long learning. We are therefore also committed to continuing professional development and postgraduate courses. We strive to let our patients have a unique, holistic, professional experience when they visit our clinics. We are also committed to providing the highest standard of dental care available and fostering long term relationships with our patients. Our aim is to inspire confidence and trust that comes with an aesthetically and functionally restored, healthy smile. Prosthodontics is typically structured in fixed, removable, and implant Prosthodontics sub specialty. These are taught primarily in the first, second, and final years of MDS. The department teaches graduate trainer in all years of BDS and MDS leading to a specialty degree in Prosthodontics. Curriculum is designed such that students go through simulation and bench courses to learn the fundamental skills evolving to more complex Prosthodontics cases in the Advanced Prosthodontics course and clinics. Courses are evaluated and updated annually for contents and are augmented with technology to teach the latest techniques in Prosthodontics within comprehensive treatment planning, Implant Dentistry, Occlusion and Aesthetics. We further aim to pursue research of high international quality, and to constantly improve on our teaching techniques/methods. Prosthodontics is the dental specialty involving crowns, fixed partial dentures (bridges), removable partial dentures, complete dentures, maxillofacial prostheses, and implant prostheses. Prosthodontics is the dental specialty pertaining to the diagnosis, treatment planning, rehabilitation and maintenance of the oral function, comfort, appearance and health of patients with clinical conditions associated with missing or deficient teeth and/or oral and maxillofacial tissues using biocompatible substitutes. Prosthodontics, also known as dental prosthetics or prosthetic dentistry, is one of nine dental specialties of Dentistry. 1. Specializes in the aesthetic (cosmetic) restoration and replacement of teeth. 2. Receives three to four years of additional training after dental school. 3. Restores optimum appearance and function to your smile. The treatment planning and restoration of implants, temporomandibular joint disorder (TMJ), and rehabilitation of occlusion with prostheses all fall under the field of Prosthodontics. Some prosthodontists, who receive additional training as maxillofacial prosthodontists, literally rebuild lost facial structure, such as eyes, nose, and large segments of the face, with appliances. Prosthodontists, in coordination with other specialists and general dentists, orchestrate overall solutions to a patient’s dental problems. 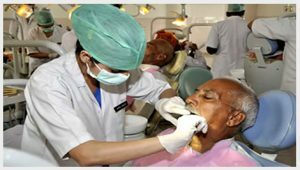 The mission of the Department of Prosthodontics at Manav Rachna Dental College is to educate under graduate and post graduate students to attain thorough skill and competency in the specialty of Prosthodontics. Through didactic and clinical teaching, students receive required knowledge and skills to fulfill the fundamental prosthetic needs of patients. Department focuses on imparting sound knowledge, teach the latest techniques and evaluate clinical competency to provide quality treatment to patients. In addition to the Prosthodontics needs of the patient, students are made to understand comprehensive care of their patients to achieve optimal oral health, esthetics and function. To teach the P. G. student the basic principles, concepts and practices of Prosthodontics required for diagnosis and treatment of patients. To train specialists in prosthodontics, who are skilled clinicians with a strong research background. Continued advancement of knowledge in prosthodontics through basic and clinical research. To provide high quality patient service by our predoctoral and postdoctoral students, and by our faculty and staff. To provide continuing education in prosthodontics to the dentists of Delhi and NCR.